Hauling is the practice of moving cargo from one place to another. Due to limited cargo hold sizes and travel times, moving things in EVE can be a time consuming and, in some places, dangerous business. Some players specialize in hauling, whether to move goods from one market to another, or to bring supplies and ships to the staging ground for a null sec alliance. This can be done for its own purposes, or can be done on behalf of others in exchange for ISK rewards via the contracting system. This can be a very viable way to make ISK for medium-skilled players. This page describes how to carry cargo ("hauling") in EVE. For specific advice on moving your own items, see moving your items. There are a few classes of ships designed for hauling. Each fills a type of niche, and what ship to use depends on the type of hauling. Fast transports, which are used to move low-volume, high-value goods quickly and safely. Tech 1 industrials have the lowest skill requirements of all hauling craft. Even alpha clones can fly them, though they can only train the Spaceship Command skills to level 1. Blockade runners are tech 2 industrial ships. They are the fastest and most agile industrial ship by quite a margin. They can align as quickly as a frigate, are some of the fastest ships in EVE at warp speeds, and even at sub-light speeds they can fly as quickly as a fast cruiser. Additionally, they can fit covert ops cloaking devices (and hence can warp while cloaked). This means that the only real danger to a properly fitted and flown blockade runner are the warp disruption bubbles in nullsec and w-space. They can carry a little less cargo than the Tech 1 fast transports, but can be fitted to carry up to about 10,000m3 of cargo (enough to carry a packaged cruiser) at the cost of reduced agility and/or speed. Deep Space Transports (DSTs) are tech 2 industrial ships with larger cargo capacities than their tech 1 equivalents and fleet hangers that hold 50,000m³ (increased by skills). They have bonuses to active tanking, either shield resistances or armor resistances, helping them to fit substantial buffer tanks. Finally, they get a unique role bonus of 100% to overheating benefits of Afterburners, Microwarpdrives, Local Repair Modules, and Resistance Modules. They also have a role bonus of +2 warp strength: this means they can't be tackled by just one warp disruptor or non-faction warp scrambler, though they can still be caught by bubbles, gangs of tacklers or HICs. Where blockade runners are meant to rely on speed and stealth to slip by the enemy, deep space transports are designed to bust their way through the enemy, relying on their warp strength and tanking abilities to escape. This probably won't work against a determined and well-prepared gatecamp, and using a deep space transport indicates to all and sundry that you have cargo you want to protect, so you should think carefully before deploying one. Freighters are the ultimate cargo carrying ships, with vast cargo holds. They are often seen flying between high sec trading hubs. All freighters have no high, mid, or rig slots but do have 3 low slots, with restrictive CPU and powergrid to limit the available modules with a role bonus to Reinforced Bulkheads. A freighter pilot's only other way of enhancing their ship's performance is via hardwiring implants. Use Freighters for huge cargo through high sec and very short distances into low sec. These require proper support (someone to web for faster aligns, scouts, preferably some EW). The four Tech 1 freighters are good for carrying very large amounts of cargo in high security space. They align and warp too slowly to be safely used in lowsec or nullsec. Freighters are very tough, but they are definitely not immune to suicide ganking -- organised and prepared groups of gankers can and do kill freighters. All four freighters get 5% bonuses to cargo capacity and velocity per level of their pilot's racial freighter skill (Amarr Freighter, Gallente Freighter and so on). Since you must train the freighter skill to at least level 1, the base capacity of the ship is only used to calculate the actual capacity. It is worth noting that the Caldari freighters with Caldari Freighter 4 can hold more than any other freighter, even with their respective freighter skills trained to 5. The Tech 2 versions of freighters, jump freighters, have a reduced cargo capacity but are capable of using cynosural fields to jump long distances. They are also able to use stargates like normal ships. (Since cynosural fields cannot be lit in highsec, jump freighters travelling in highsec have to use stargates.) This makes them ideal supply ships for people who live in nullsec. Jump Freighters are used to carry cargo from the high/low sec border to wherever it is needed in null sec and back again. Caldari freighters are the largest, closely followed by Gallente, then Amarr and lastly Minmatar, which is partially compensated for by lower fuel use. The difference is not large though. Jump freighters have much larger potential tanks than Tech 1 freighters when properly fit, but at the cost of a much reduced cargo bay. All jump freighters can exceed 500,000 EHP in tank, which makes ganking them in highsec extraordinarily difficult and expensive. All holds, hangars and bays except the Drone Bay can be scanned by a Cargo Scanner. However, due to how cargo scanners work, modules fitted to ships in the Ship Maintenance Bay are not detectable by scanning. However, the Orca requires a completely different skill set to most haulers. After the Odyssey skill changes, it will take 18d 19h 6m to train. This is a significant cut in training time from the old requirements pre-Odyssey. There are situations where a small fast craft is better then a big lumbering beast. These include moving blueprints or other small volume, high value cargo. One option is a warpstab or nano-fit frigate with a propulsion mod to try and burn away from tacklers. However, the best option at this size is a Covert Ops Frigate, which can provide near-perfect safety if handled correctly. Using a shuttle or untanked frigate to move through lowsec with high-value cargo is not recommended due to the danger of smartbombing battleships. An interceptor is the best option for moving through nullsec, assuming it is properly fit. Even in highsec, frigates are very safe but not 100% safe if you carry valuable cargo (the Perimeter gate in Jita is the most scanned point in the game). A travel ceptor is another option: fast, quick-aligning, and immune to bubbles in nullsec. A Victorieux Luxury Yacht can warp cloaked, ignores nullsec bubbles, can be fit with enough tank to survive smartbombs, and has very decent align time and warp speed. That is another good option for moving high-value, low-volume cargo. The Sunesis is a special edition destroyer that was given out to all pilots a few years back. Various fitting options as a hauler exist, with one fitting it can align in less than two seconds, hold 900m3 +, and warp at 7AU/s. Amarr have the largest capacity T1 Industrial but otherwise tend to be outperformed by other races. Minmatar haulers tend to align and fly slightly faster than other factions, but don't sacrifice cargo or tank to do it, making them arguably the best industrials overall. Caldari have the largest capacity freighters, and unquestionably the tankiest T1 industrials. The specialized Gallente T1 haulers (and to a lesser extent the Minmatar ammo hauler) are extremely convenient if you regularly haul ore/minerals/PI/ammo. To maximize flexibility, it's recommended that all new haulers train Gallente and Minmatar industrals to at least 3, and from there decide which race to train to 5 depending on what exactly it is you want to do. The best hauler is situational; it depends on where you are (high, low, null security space) combined with how large and valuable the cargo is. For example, using an Occator to move a cargo small enough to fit in a Viator is sub-optimal, as is using a Viator to move large amounts of tritanium around in high sec when you could use a Kryos instead. Below are the optimal ships for each task, assuming that the area that you're going to/through is not a place where it's a clearly bad idea to bring such a ship type. As soon as moving through either null or low sec is required, you are strongly encouraged to switch to a Viator (blockade runner) or jump freighter. The Orca is also a very interesting option for high security space. It offers cargo capacity somewhere between the T1/T2 industrials and jump freighters, while being able to travel almost as quickly as the smaller ships by fitting a 500MN micro warp drive and activating it for 1 cycle while aligning to the next gate or station. Large cargo of high value: Blockade runner (even if you may get the job done faster with a DST, getting it there at all is better then not getting it there due to being ganked) or Orca. Warp Drive Operation: Helps with long warps. Each skill level reduces the capacitor need of initiating warp by 10%. Spaceship Command: Reduces align time. 2% improved ship agility for all ships per skill level. Evasive Maneuvering: Increases ship agility and acceleration. 5% improved ship agility for all ships per skill level. Power Grid Management II & Tactical Shield Manipulation IV: Allows use of Adaptive Invulnerability Field II. Hull Upgrades IV: Allows use of T2 Damage Control. There is a trade-off with the cargo expanders typically used by haulers, however. Energy Grid Upgrades IV, Power Grid Management II, and Science I: Allows use of T2 Power Diagnostic Systems. Some shield tankers prefer these over Damage Controls for the boost in shield recharge rate (that recharge will not have time to make up for the ehp loss compared to a damage control before concord arrives, even in a 0.5 with a 13 second delay, but it can be combined with a damage control). There are several types of tanking: buffer tanking, passive tanking and active tanking. Additionally, some buffer tanks are entirely passive (no active modules) and others include active resistances and damage control modules. The active modules must be turned on after every jump; remapping them to the F1-F8 keys makes this more convenient. For high sec operation, the buffer tank is most common, as the goal is to survive the alpha strike (initial volley) of the attacking gankers and remain alive long enough for CONCORD to come and destroy the attacker(s). T1 Industrials are typically buffer shield tanked. In most cases you will be using your low slots for cargo expander modules; so using shield modules that fit in the middle slots is the preferred route. An example buffer tank fit would include 1x EM (or Kinetic, against Catalyst damage) Ward Amplifier, 1x Thermal Dissipation Amplifier and 2-3x Medium Shield Extenders. One or two Adaptive Invulnerability Fields can also be used, but remember that requires capacitor to run and has to be restarted after every jump. A Damage Control II will also add a lot of buffer, but requires removing an Expanded Cargohold module. For hauling, passive shield tank skills are key, followed by the ability to use a Damage Control II and Adaptive Invulnerability Field II. After that, armor tanking can be considered, but that takes away cargo space quickly as you burn up low slots with armor plates/hardeners instead of Expanded Cargohold modules. Note that Tech 2 Deep Space Transports, and specialized Gallente haulers like the Miasmos, Epithal or Kryos are mostly useful for their specialized holds which are unaffected by Expanded Cargohold modules. These ships can, and should, be fitted with tanking or agility low slot modules, making armour tanked Deep Space Transports like the Impel a common sight. Visibly active tanking (most notably the Adaptive Invulnerability Field) might discourage ganking by the discriminating ganker, but your capacitor will not allow you to keep them running at all times. Remember turn them on when you align out of a gate and to turn them off once you are in warp. Turning them back on when you land at your destination gate is optional, but having them active as you land at a busy station like a trade hub is recommended. The best form of tanking for haulers is not getting caught in the first place. Use the Cloak Trick wherever possible (always on Deep Space Transports), and consider warp stabilisers as an option if you have fitting slots to spare. Flying AFK using the autopilot is the #1 way that most haulers lose their ships. When you use the autopilot to fly you to your destination, it warps you to 15km from the next gate then you slowly approach the gate at 100-200 m/s (slower in a Freighter). At a minimum, this leaves you exposed for about a minute per gate and gives any potential attacker time to scan your ship, scan your cargo, then get ahead of you and setup a gank party. At worst, it gives you time to be bumped and ganked right there. If you must fly AFK, know your route, keep your cargo value very low, and fit as much buffer tank as possible. There are areas of space where flying AFK is reasonably safe, but the longer you do it, the higher the chances that someone will notice the pattern and try to take advantage of it. The more EHP that you have, the harder it is for the attacker to blow up your ship and steal your stuff. In the case of low/null security space, a WCS (warp core stabilizer) may be the difference between getting away and getting blown up. For T1 industrial ships, you will want to fit as many medium/large shield extenders into the mid slots as possible. This should be balanced with shoring up your weak EMP/Thermal resist holes using Adaptive Invulnerability Field modules or Shield Resist Amplifier modules. In cases where you need more EHP and can sacrifice cargo space, consider adding DC2 (Damage Control Unit II) modules, reinforced bulkheads, or armor resist modules. A poorly fit T1 industrial hauler will only have 4k to 6k EHP, a well fit T1 industrial can have 10k to 20k EHP without sacrificing too much cargo space. For Orcas, the standard fit is a DC2 and a Reinforced Bulkhead II in the Low Slots and three Large Transverse Bulkhead II rigs. This takes your ship from about 150k EHP up to about 420k EHP. The addition of some passive shield resistance amplifiers (2x EM, 1x Kinetic, 1x Thermal) will increase the EHP to about 450k without any shield skills. Replacing the passive Amplifiers with active Hardeners adds another bit of EHP but requires more attention and has no effect on alpha damage. Using Cargo rigs is discouraged since you lose about 170k EHP for a low amount of additional cargohold. You should train Hull Upgrades IV and Mechanics IV (or better V) before undocking, being able to use a DCU II gives a really nice EHP boost and since you are almost full-hull-tank, the extra 5% from Mechanics V are also very nice. You should also consider using a Inherent Implants 'Noble' MC (Slot 8) which increase hull HP by anything from 1% up to 6%. Blockade runners rely on good bookmarks, crafty use of their Covert Ops Cloak, MWD, and not fitting anything that would increase signature radius (no shield extenders). Due to their use of a covops cloak, well-flown blockade runners can be almost impossible to catch in hi-sec / lo-sec. So they are a good choice for more expensive cargo runs. But they are also very flimsy and can easily be ganked if you leave them uncloaked at a gate. Deep Space Transports, used in high-security space, haul almost exclusively in their Fleet Hanger which is unaffected by expanded cargoholds, so low slots can be used entirely for armor tank, or for shield tanked ships, for ability/speed modules. Freighters and Jump Freighters have three low slots and can fit any combination of cargohold expanders, nanofiber structures, inertia stabilizers, or reinforced bulkheads. How you fit a freighter depends on what you want to do, but it is strongly recommended to fit reinforced bulkheads whenever possible and to not fit cargohold expanders unless absolutely necessary, as the expanders will reduce your overall tank substantially. In the case of a "suicide" gank, the goal of the attacker is to trade their ship for your cargo. They do this by knowing how much ISK they will lose when their ship gets blown up by CONCORD and how much ISK your cargo is worth. Therefore your defense against a profit-minded attacker is to raise their costs while keeping the value of your cargo below the attacker's break-even point. This means that if your ship has 8k EHP, you should not be carrying more than 24M ISK worth of cargo and fit modules per trip. The more that you exceed that ISK/EHP value, the more likely you are to get ganked. However, you can often get away with 4M-6M ISK per 1k EHP if you know your route, do not auto-pilot, and know the key risk factors. Another alternative is the 50 million isk maximum collateral for T1 industrial haulers used by several hauling corporations. They will haul cargo up to 50,000,000 isk and 17,000 m3 in size using T1 industrial ships. This gives an indication of what they consider to be safe for high sec hauling in that type of ship. For freighters, which have about 180-200k EHP, the benchmark value is 1B ISK (one billion). As your cargo value exceeds 1B ISK, combined with traveling through systems with a security status in the 0.5-0.6 range, it becomes more and more likely that someone will gank you for your cargo value. This is a bit of a fuzzy rule of thumb and in the quieter portions of the galaxy with routes that take you only through 0.8 and above systems, you can get away with hauling higher value cargo loads for a very long time. When you have expensive cargo above 1B to be moved in a freighter, you may want to consider double-wrapping it (create courier contract for some other alt of yours and then create another courier contract from this alt to actual freighter pilot). It will hide the contents of this package (assembled containers give same result), but some gankers tend to gank double wrapped transports without knowing what's inside, so most people (including hauling corporations) consider this will increase the risk, not decrease it. Your best friend as a hauler in high-security space is knowledge of the local terrain. Which systems tend to be camped by gank parties. Which systems see frequent kills of haulers? Where are you likely to be cargo/ship scanned? What is the security status of the systems along the route? Scouting, in low-security or null-security space, is a must-do if you are carrying anything expensive, or are not flying a blockade runner. In low-security space, a well-flown blockade runner is almost impossible to catch and it can usually get past most null-sec bubble camps. A useful in-game channel is Gank-Intel where the hauling community often shares info about frequently travelled routes. Asking about the current situation in there before embarking on a high value contract through a dangerous area can be invaluable. Busier market hub stations (such as Jita CNAP 4-4) will have people camping the undock 23x7, waiting for you to undock with something shiny in the cargo hold. Your #1 defense against this is to prepare an insta-undock bookmark ahead of time. A good bookmark will get you off the station undock and out to a safe-spot before anyone has time to lock you, scan you and gank you. They are a must-have for Blockade Runners and rather important for the slower-aligning ships like Orcas and Freighters. Instant docks are also essential. Occasionally when auto-docking, the game will place you outside the immediate docking radius, and you will need to slow boat into the docking radius. This is particularly problematic at Jita 4-4, where entering from Perimeter (one of the most common entry systems) will place you at the back of the station if using the "Dock" command. Several gankers make an excellent living from sitting at this area, and picking off lazy Blockade Runner pilots. Setting an Instant-Dock right as you exit the station means you are assured to warp within the docking radius and prevent an easy kill for a ganker. Do not be predictable in your hauling of expensive items. Vary the time of day. Vary the route that you use. Change your ship name frequently. There are several organisations in Eve which act as dedicated Hauling companies. They tend to be more reliable, more willing to take on unusual or high value requests, but also more expensive than the public contracts channel. Characters in Eve can use these corporations either for their own hauling needs, or consider joining them to get access to exclusive, high value contracts. If you are considering hauling as a career, the best way to make money is as part of one of these corporations. Setting up an alt hauler can be very useful to ship goods around during wartime when your main can't fly an industrial ship. If you have a high amount of ISK to devote to collateral, courier contract hauling can be a very good way to make ISK for haulers, given that you have a freighter or jump freighter to haul around the usually large quantities of contracted goods. One billion ISK (1,000,000,000 ISK) is a good estimate for how much money you will need to get started taking courier hauling. A courier hauler can make a lot of isk, but it's not without risk. Ganking is one problem, contract scams is another. It's always a good idea to check the contract history of an unknown contractor before accepting anything. This information can be found by opening the 'info' window of a player, clicking the three lines in the top left corner and selecting 'Show Contracts'. One type of scam contract involves a low value package with a moderate or high collateral that goes to a player owned structure where the courier can't dock. The simplest version of this is a structure with docking rights revoked from the start, this can be seen under the 'Services' tab. A more devious way is for the contractor to revoke docking rights only after the contract has been accepted. A structure with a history of turning on and off its docking rights can be identified by the following tool https://stop.hammerti.me.uk/structure/ . Another type of scam contract that appears less suspicious at a first glance involve a valuable package and an overpriced collateral. These contracts are designed to make the hauler a tempting target for random gankers so the contractor can cash in on the overpriced collateral. They can be spotted by a contract history of sending the same package (same size) back and forth between two systems along a dangerous route. It could for example be between Amarr and Dodixie, which will take the hauler through both Niarja and Uedama which are both infamous for the amount of high-sec ganking going on there. For more information on scams involving courier contracts, see the page on scams in EVE. The in-game "Haulers Channel" provides a friendly community of haulers, feed of well-paid contracts around the trade hubs, and gank-intel. 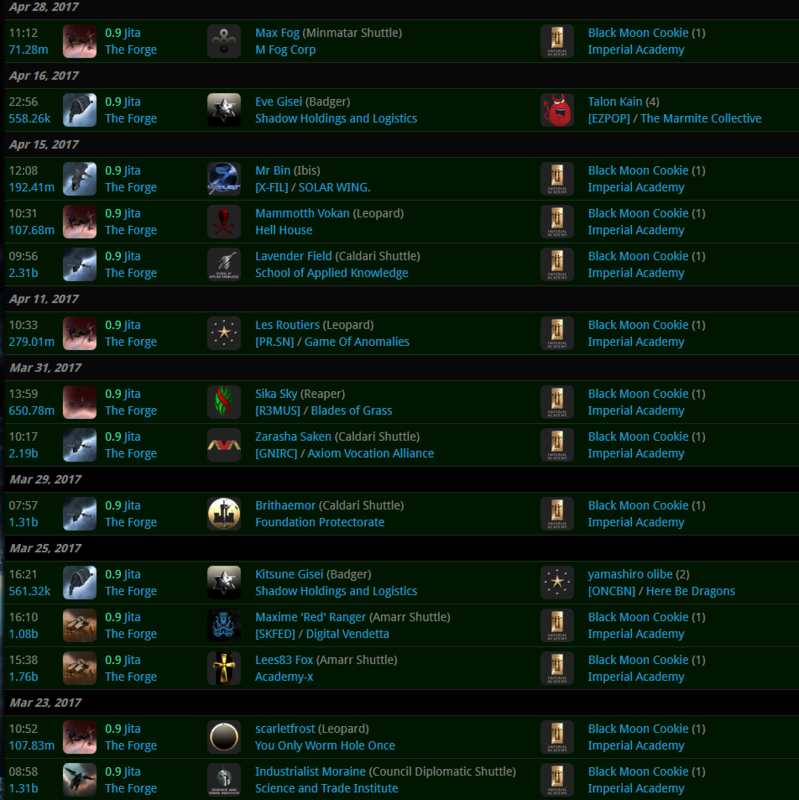 The channel is moderated by a prolific trader in Jita and open to everyone. If you're using your hauler in a mining operation (without an Orca), consider fitting a tractor beam to bring cans to you faster, as well as a salvager to make something of the inevitable rat wrecks. In addition, putting out a Mobile Tractor Unit can make it easy to pick up cans from other miners and then haul them to station (Make sure to have your drones on passive!). You could also fit a mining laser, but even a good one with pilot skills won't be getting much more than 100 m^3 per minute. Haulers can also be used to make ISK via missioning, as described for Level 4 Cargo Missions. This page was last modified on 27 October 2018, at 02:30. This page has been accessed 530,183 times.